MyDefrag is a free defragmentation program for all Windows systems starting from Windows 2000*1. MyDefrag*2 defragments very fast, has several optimisation strategies, offers highest possible data security and can also defragment external storage media. However you can input options only by a script grammar. *2) languages: american • dutch • english • esperanto • french • german • italian • japanese • russian • spanish • Many thanks to the translators. In order to get the newest translation download this package. If you like to see your own language, have improvements or corrections of an existing language, please translate the file mylanguage.txt (right click on the link and choose "Save target as") and send it to 1[at]kandro[dot]de. I will integrate it. Standard version. No installation or configuration necessary, it's ready to run and will automatically process all the mounted, writable, fixed volumes on your computer. Specially designed to set up the screensaver. In addition the file MyDefragScreenSaver.scr have to be in the system folder. For starting MyDefrag without handling the script grammar and with additional functions. Also for simple configuring the task manager and the screensaver. Compiled offline HTML help file for fast looking up. 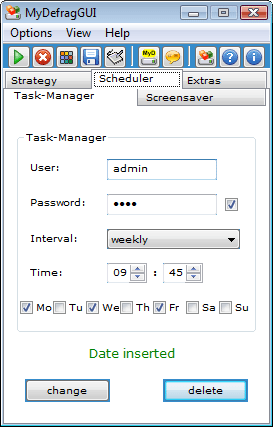 This interface program handles the controls of the entries in the Windows task scheduler (Task-Manager). If the file is in the system folder it will automatically become visible in the list of screensavers as "MyDefragScreenSaver" and can be used just like any other screensaver. In this file are stored the completed tasks and analyses of the drive(s). MyDefragScreenSaver.log and MyDefragTaskManager.log are produced by the appropriate applications. In this file are stored the personal settings. If this file will be deleted, the settings are set to default. In these files the texts of the different languages are stored. MyDefrag is based on the standard Defragmentation Interface by Microsoft (the FSCTL_GET_VOLUME_BITMAP, FSCTL_GET_RETRIEVAL_POINTERS, and FSCTL_MOVE_FILE function calls), just like all other defragmenter. It is therefore very solid, there is no risk of losing data or the disk getting scrambled, and you can run it while the computer is in full use. MyDefrag has to scan all the files on the disk to determine if they are fragmented and where they are. At the moment it has to use very inefficient Microsoft function calls, in the future I hope to speed this up by directly reading the MFT and FAT. All fragmented files are defragmented, simply by moving them to the first gap on the disk that is big enough. If there is no gap big enough then the defragmenter will reduce the number of fragments in the file by moving as much of the file as possible into the largest gaps available. Windows reserves a percentage of the disk for the MFT (Master File Table), but can place normal files there if the rest of the disk is full. The files will remain there, even when there is enough space again. MyDefrag looks for files in the MFT reserved space and moves them to normal disk space, making the reserved space available again for the MFT. 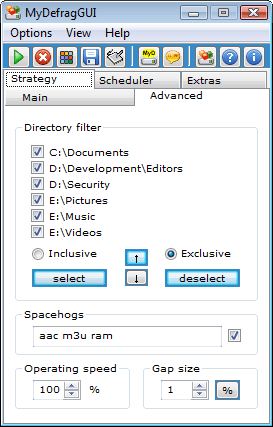 Regular files are moved out of the directory zone, and space hogs are moved out of the directory and regular zones. This prepares the disk for the next step (optimisation) so it can do a better job. See below for more information about the zones. On most hard disks the beginning of the hard disk is considerably faster than the end (see therefore in the chapter "Links" the program "DiskSpeed32"). The default MyDefrag optimisation strategy therefore moves all files to the beginning of the volume. It is intended for daily use and will simply fill gaps with files from above, very quick and with very little data movement. Sorting the files on your disk can give you even more speed. There are several sorting strategies to choose from. These are all very slow and intended for occasional use only. MyDefrag classifies files into five zones. Files outside their zone are moved to their zone. Directories are perhaps the most accessed data on disk, so zone 1 is placed at the beginning of the hard disk. After the directories comes a free area, then zone 2 with regular files, another free area, and then zone 3 with big files, which are files bigger than 50 megabytes; files with certain filenames such as archives; files in the recycle bin; service pack files, and other infrequently accessed data. The begin and end of the zones is determined automatically. A running computer will create and delete temporary files like there is no tomorrow. If the hard disk were completely optimised then the only place for new temporary files would be behind all the other data. Which is rather slow. So MyDefrag maintains a free space of 1% of the disk space between the zones. When the utility is running you will see lot's of messages zipping by showing you exactly what is happening. The messages are also stored in a log file for later inspection. The log file may also contain warning messages, for example when a file could not be moved. This is normal, no need to worry. Windows has many system files that cannot be moved while Windows is running. MyDefrag shows a high-detail map of the hard disk. Bottom-left of the window is the beginning of the hard disk. Snapshot of MyDefrag in action. Permissions: MyDefragGUI needs "full control" permissions to all files that it must defragment/optimise. On a default Windows system the "administrator" user ID has full permissions to all files. Other users can also run MyDefragGUI, but then it can only defragment/optimise the files for which the user has "full control". On Windows Vista: right-click the MyDefrag program and select "run as administrator". Stopping: MyDefrag can be stopped safely at any time, there is no risk of losing data or corrupting your disk. 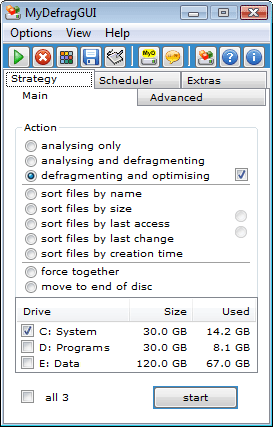 Here you can select a certain drive or a certain partition for analysis / defragmentation / optimisation (actions 1 - 10). In addition, all drives / partitions can be selected at one time. If only a certain directory has to be defragmented you can select this in the first range. If a certain directory or drive / partition shall not defragmented you can select this in the second range. The contained files will be not defragmented and not displaced. Spacehogs are less important files that take up a lot of space. MyDefrag moves them behind the directories and the regular files, to make those faster. You can add into the input field your own Spacehogs independently of the internal Spacehogs (see in addition the -u mask with the command line parameters). If you want to have e. g. avi, zip and log files as Spacehogs type "avi zip log" (filename extensions without double quotes and separated by spaces) into the input field. You can specify with the checkbox whether the internal Spacehogs list is to be used or not. You can reduce the speed (default 100%) in order to reduce processor load if other computationally intensive programs are simultaneously running. Specifies the size of the free spaces between the zones. 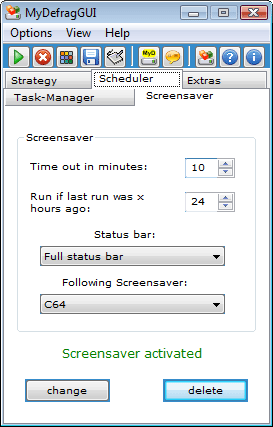 The strategy- and log-settings are taken over also by the Task-Manager and by the screen saver by inserting respectively activating or changing them. If you want to defragment at certain times with fixed intervals you can adjust these here with the Windows Task-Manager. If you want to defragment at certain intervals by the screen saver you can install and configure MyDefrag as screen saver. You can specify as extras things like creating a log file or shutdown the computer after defragmentation. For further details look at the program documentation - which is attached to the program. Tip: Cleanup old junk from your hard disk before running MyDefragGUI. Tip: Stop your real time virus scanner before running MyDefragGUI. Virus scanners check all disk activity, making defragmentation and optimisation very slow. Tip: Move the swap file to another volume, reboot, defragment, and move the swap file back. If you don't have a second volume then temporarily make the swap file small, for example 100 MB. Tip: If a program (for example a database) prevents certain files from being defragged then stop the program, run MyDefrag for the particular data directory only, and restart the program. Tip: Run the program with the "-a 6" option to move infrequently used files to the end of the disk (for example "C:\RECYCLER" and "C:\WINNT\$*"), then run the program again and exclude those files with the "-e" option. What is the difference between MyDefragGUI and JkDefragGUI? MyDefragGUI v2 (MyDefrag v4) is the successor of JkDefragGUI v1 (JkDefrag v3). Apart from many small extensions and improvements the main difference is that JkDefrag is operated by command line and MyDefrag by scripts. For users of the GUI this makes no difference. Furthermore MyDefrag can defragment special system files. MyDefrag is based on the standard defragmentation API by Microsoft, a system library that is included in Windows 2000, XP, and Vista. All defragmenter are based on this API, including commercial defragmenter. MyDefrag is therefore very solid and there is no risk of losing data. You can stop the program at any time, it will finish the current file in the background. If your disks use NTFS then you're even safe when the computer crashes in the middle of defragging. Nevertheless, it's still a good idea to backup before defragmenting, just like with other defragmenter, because the heavy use of the hard disk may trigger a hardware fault. Why is my disk not perfectly optimised? There are many files that cannot be moved while Windows is running, because they are in use by an application, or by a service, or by Windows itself. See the "-d" command line options and the log file for more information. They can be anywhere on disk and are usually fragmented into microscopically small segments. In other words, the hard disk is not a big block of space where files can be moved at will, but thousands of little blocks bounded by unmovable data. A typical hard disk can easily contain tens of thousands of files, all with different sizes. What is the optimum way to organize the files into the blocks? The number of permutations is astronomical, it boggles the mind. MyDefrag doesn't even try to calculate them all. It concerns itself with only one block at a time, trying to fit only files from above the block, and limits itself to 0.5 seconds of calculating time. So it's very unlikely, if not impossible, for MyDefrag to perfectly optimise your disk, more's the pity. Gaps are only filled with files from above the gap. If there are no files that fit the gap (all files are bigger) then the gap cannot be filled. Gaps can only be enlarged by the full optimisation if it can move whatever file is just above the gap. Files can only be fully defragged if there is a gap large enough to hold the entire file. If no such gap is available then MyDefrag will try to reduce the number of fragments by moving the file to the largest gaps available. MyDefrag maintains a "free space" area just above the directories at the beginning of the hard disk. This is by design. See gap size to control the size of this free space. Spacehogs are big, less important files that take up a lot of space. These files will be moved behind the end of the 'regular' files. Can I run MyDefrag outside Windows? MyDefrag is based on the Windows defragmentation library, so Windows must be started. MyDefrag can be run from a bootable Windows CD-ROM (such as BartPE, see http://www.bootcd.us/), but cannot be run from a DOS bootable floppy. How can I disable the User Account Control (UAC) on Windows Vista? Why use this defragger instead of the standard Windows defragger? Maintains a free space for temporary files. Can defragment very full hard disks. Can be used from the command line. Why use this defragger instead of a commercial or shareware defragger? Sources available, guaranteed to be free of spyware, malware, nagware, and such. There is a forum for JkDefrag/MyDefrag which is operated by Jeroen Kessels. There you can place questions, give feedback and share your experiences with the program. For questions about how to use MyDefrag. discussions and feedback about bugs and problems. Do you have an idea for a useful new feature? MyDefrag and MyDefragGUI are 100% free of viruses or other malware, nevertheless an anti-virus program can announce in rare cases falsely an alleged virus. The task manager at JkDefragGUI doesn't work without password/codeword of the current Windows user (Version 1.5 and lower). If no password is present, you can create one as follows: Start → Control Panel → User → Create password. There is in addition a Workaround the task manager can used without a password. This is recommended however only for advanced users. For Windows Pro: Start/Administrative Tools/'Local Security Policy/Security Settings\Local Policies\Security Options Accounts: Limit local account use of blank passwords to console logon only. This is in default activated. You have to deactivate it. For Windows Home: Start/execute/Regedit and change the following key: Path: HKEY_LOCAL_MACHINE\SYSTEM\CurrentControlSet\Control\Lsa Name: limitblankpassworduse, Type: REG_DWORD, value: 1 (activated) 0 (deactivated). Set the value to 0. MyDefrag makes a special exception for files used by SafeBoot, Acronis OS Selector, SecurStar DriveCrypt, and Symantec GoBack. The files will never be moved. The Windows defragmentation API refuses to move directories on FAT32 file systems. This is a known FAT32 limitation and not a bug in MyDefrag. The Windows defragmentation API does not work on Windows 2000 with disks that were formatted with a cluster size greater than 4 kB. This is a known API limitation and not a bug in MyDefrag. - Fixed a problem with extremely long path names. Feb 01, 2008 - Re-fixed the "DisableDefaults" bug. - Partial undo of the change that uses the mount point of a volume. It was causing problems during the automatic scanning for disks to be defragmented. - Pushed the "Zone calculation" messages down to debug level 4. - Fixed the VisualC example project. JkDefrag 3.24 Sep 03, 2007 - A final fix for the out-of-sequence problem. - Bugfix for missing parameter in status message that caused JkDefrag to crash when it wanted to display the "Cannot find volume name for mount point" message. This message can happen when scanning the system for disks and a special volume is encountered such as a "subst" volume. - The "25 largest items on disk" list in the status report is now sorted by (used) clusters instead of by (allocated) bytes. - Fixed the progress percentage during analysis of NTFS volumes. It was counting too fast and reached 100% before analysis was complete. - The "unmovable", "still fragmented", and "largest 25" lists in the report are now suppressed if empty. - Directories on FAT disks cannot be moved, this is a known limitation of the Microsoft defragmentation API and not a bug in JkDefrag. To speed up things the program will now count the number of failed tries to move directories, and when it reaches 20 will ignore all directories. JkDefrag 3.16 Jun 22, 2007 - Changed the message in the docs about the screen saver under Vista, it works if User Account Control is turned off. - Bugfix in "-a 3" (fast optimise). It would not use Perfect Fit for gaps that were larger than all the data already processed. - Bugfix in "-a 6" (move to end of disk). Files in zone 1 would not be moved. - Added some translations of "Program Files" to the build-in list of Spacehogs. - Fixed a typo in the "System Volume Information" string in the Spacehogs. - Fixed the displaying of the zone number, should have been + 1. Forum for MyDefrag, a place where you can ask questions, give feedback about features you would like, share your experiences, share code that uses the defragger library, and other things about MyDefrag. Paging files and registry hives cannot be defragmented on a running system. This sweet little utility will automatically defragment those files when the system is booting. The counterpart of this utility is "Contig", a small defragger for use on a running system, but my defragger is far superior. Small utility that shows which file is using a particular location on the hard disk. Use this if you are wondering which file MyDefrag could not move. The utility takes a while to start up, because it has to analyse all files one by one, but it's a very nice little utility nevertheless. Handy utility to discover all the things that are started when windows is booting. Measure the speed of your hard disk. discover how much faster your hard disk is at it's begin than at it's end. Measure your hard disk and discover how much faster it is at the begin than at the end. Can also monitor the temperature of your hard disk and scan for surface errors. LiberKey is a program collection of selected free software and useful tools for local or portable (e.g. USB memory stick) use. MyDefragGUI is one of the integrated programs. If you have questions etc. you can send me a mail to Markus[at]Hörl[dot]org or 1[at]kandro[dot]de. MyDefragGUI is a private project. The software on 8qm/mydefrag is freeware. That means, that it is passed on free of charge. If you like this site or the offered programs you can make a donation to my PayPal account. You can contribute to reduce the maintenance costs for the server and other resulting costs to cover. By your donation you contribute that the project can continue and I can invest time into the advancement.